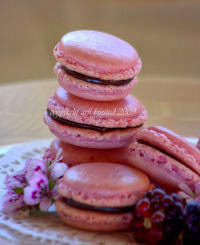 This month's Mac Tweets challenge was to try something new with your macarons. I wanted to create a mini dessert with mine, and see what would happen if I used brown sugar instead of the granulated sugar. I also added a couple of spoons of grated dark chocolate to the mixture. The result was very chewy macarons and they had larger feet than I wanted, but they still tasted pretty good. I used a one egg white recipe again, as I was experimenting. 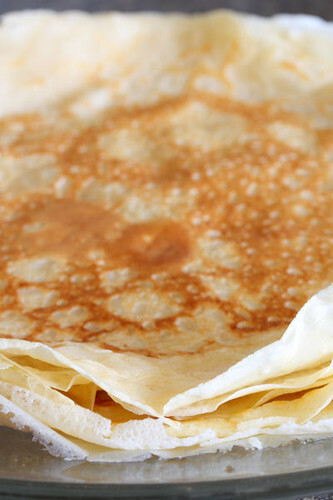 This recipe uses 1 egg white and only makes about 14 halves, 1½" across. 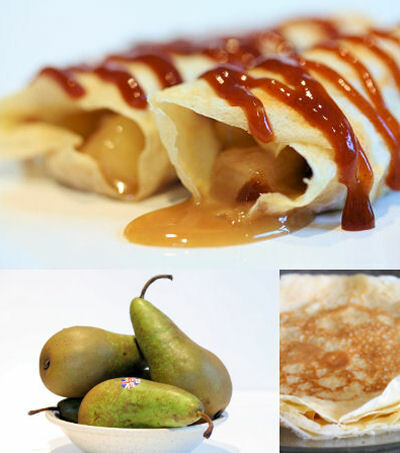 Bear in mind that these were experimental using some brown sugar, and that did make for a more chewy texture. I did not age the eggwhite overnight, but bought it to room temperature for about an hour before using. Mix the ground almonds, icing sugar and chocolate together in a bowl and put to one side. In a large clean, dry bowl, whip the egg white with a pinch of salt until it becomes foamy and stiff. 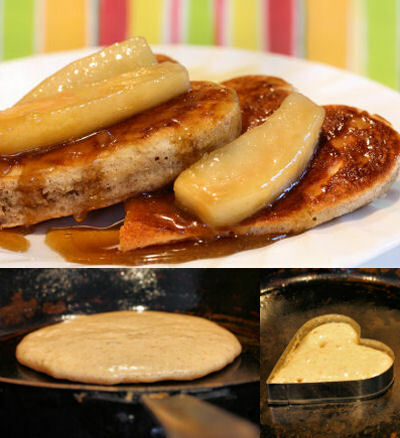 Gradually add the brown sugar, whisking well after each addition, until the mixture is stiff and shiny. Fill a piping bag with a 1cm round tip and pipe the mixture onto Silpat or baking parchment. Tap the sheets gently to remove air bubbles. 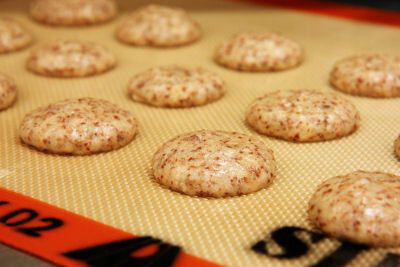 Let dry at room temperature for about an hour or so before baking. 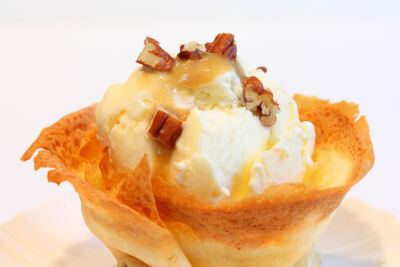 Whip the cream until stiff and gently fold in the banana. 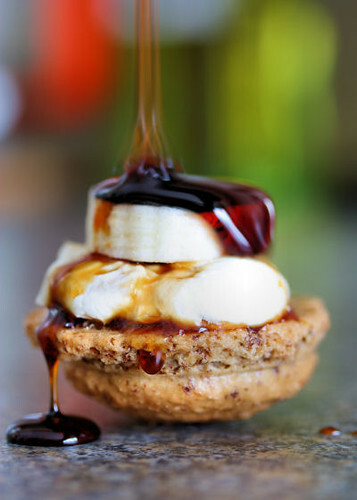 Pipe or spoon onto one half of the macarons, drizzle with caramel and top with the other half before serving. Where did the last year go? Or the last 10 for that matter! I know it's a New Year and all that, but I still needed to use up some Christmas pudding from the recipe challenge back in November 09. 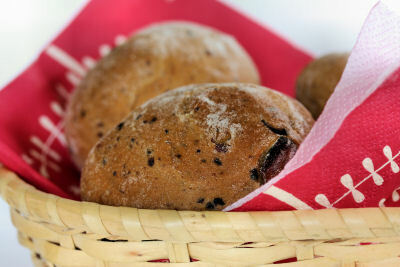 I made some bread rolls, using my Buns with Berries and Cherries recipe, swapping the dried fruit for about 4-6oz of Christmas pudding, but you can use your favourite bread dough. Christmas may be over, but you can enjoy the leftovers for a little longer! 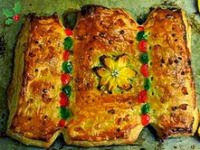 I must remember these for next year, it would be lovely to eat them on Christmas morning, fresh from the oven! I'm submitting this to YeastSpotting, which is a weekly showcase of yeasted baked goods and dishes with bread as a main ingredient. 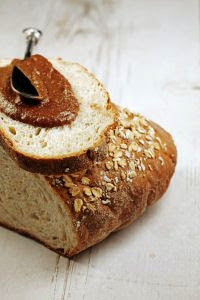 If you love baking with yeast, check out the beautiful breads and other yeast recipes here. Thanks for all the entries for this month's Sugar High Friday. It looks like you all enjoyed the festive holidays and have come up with some truly stunning desserts and sweet treats! I've discovered lots of new, wonderful blogs, have made some new friends along the way and have a list of great recipes to try out this year! Dhanggit from Dhanggit's Kitchen celebrated her birthday with this beautiful festive Orange Charlotte with Chocolate Porto Sabayon. 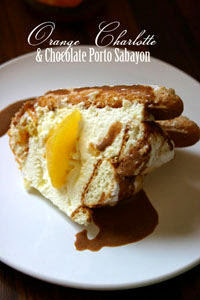 Sabayon is an Italian cream which is perfect for your citrus fruit salads. Happy Birthday to you Dhanggit, and I hope your romantic-gastronomic escapade with your husband was magical! 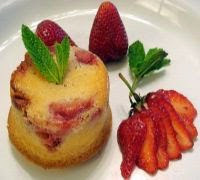 Mansi from Fun and Food Cafe works wonders with saffron - she shares her recipe for Saffron-Kissed Strawberry Muffins. They are light, airy and soft, with just the perfect amount of sweetness and adding the saffron gives the muffins a wonderful aroma! 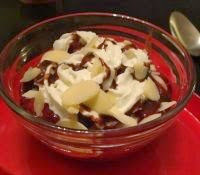 Mansi's second entry from her Food and Fun Blog was this deceptively simple Chocolate Raspberry Pudding. Mansi urges us to use raspberries instead of cranberries in our desserts this year, and paired with chocolate and almonds I can see why! 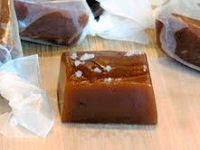 Laura from The Spiced Life challenged herself to make caramel, and comes up with some amazing Salty Vanilla Bean Caramel Chews. 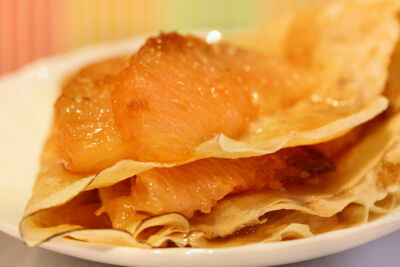 There's something wonderful about the sweet and salty combination, but it would be hard to resist eating just one! 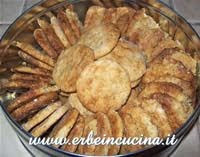 Graziana from Erbe in cucina (Cooking with herbs) is trying many new Christmas recipes this year. One of these recipes is Pepparkakor, Swedish Christmas Cookies - which are spiced traditional Christmas cookies from Sweden, with ginger, cloves and cinnamon. You could store these in a jar, but I think they will be gone long before they even see the jar! Maunika from Cook in a Curry is keeping in with the Christmas spirit. 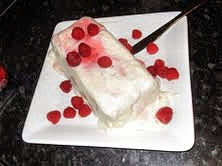 She has made a delightful Berry Meringue Terrine, which can be made ahead of time and frozen until the festivities get under way. Meringues, crushed raspberries & strawberries, mixed with crème fraiche and some berry coulis is my idea of festive heaven! 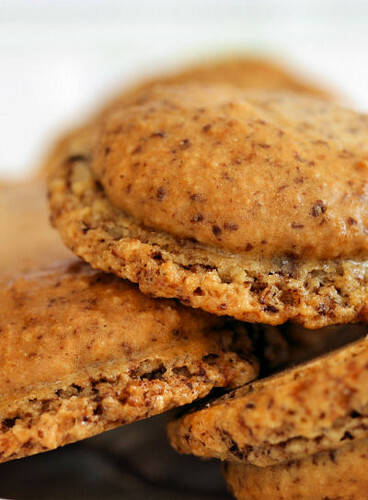 Arfi from HomeMadeS has created one of my favourite holiday treats, French Macarons. Using milk chocolate, flavoured with raspberry essence and plum coloured powder, the macarons transform into the most fabulous Christmas gifts and Arfi is baking them for her neighbours, family and friends this year - aren't they lucky? 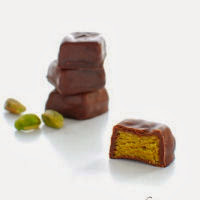 Vanille from At Down Under has made me very jealous with her Chocolates Filled with Pistachio Paste. She's going to be sharing them with her sister during the Christmas holidays, I wonder if she knows she has a long lost sister in the UK! 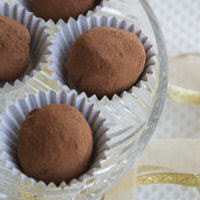 Susan from Food Blogga has captured my heart with her Easy Ginger Chocolate Truffles. I adore ginger, and these rich chocolate truffles are enhanced with spicy candied ginger. 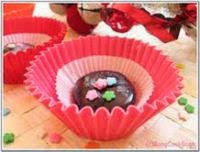 Pop them into decorative foil cups and you have fabulous festive holiday gifts! Soma from eCurry comes armed with pomegranates! You can't help but get into the holiday mood with her Layered Pomegranates, Cranberry and Chocolate Mousse. 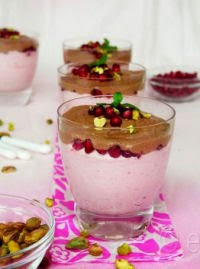 It's an easy mousse to make, and you can decorate and serve it in individual cups. 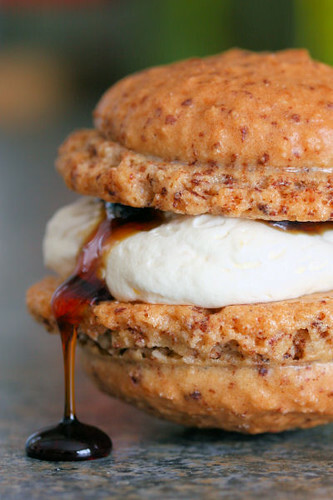 I'll be humming holiday tunes all day after a taste of this! 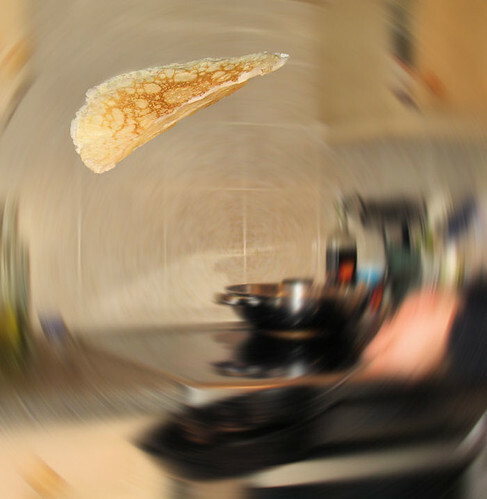 Ben from What’s cooking? 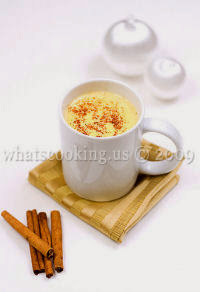 warms us up with a hot Christmas drink called Rompope Atole, which is popular in Mexico. It's a Mexican egg punch created during the colonial era in the convents of the city of Puebla. One particular nun went to great lengths to convince the church to let other nuns enjoy this delicious drink, I wouldn't need telling twice that a small cup of this would be good for me! Saveur from Taste Space has the holiday season all figured out with her Cranberry Buckle with Vanilla Crumb. It's a cake with vanilla streusel topping and comes complete with 'dancing cranberries'! 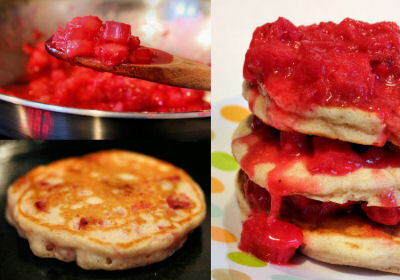 Just make sure you don't halve the recipe because the leftovers taste just as good! Bee and Jai from Jugalbandi made me laugh out loud when I read their post about making Vegan Nutella (Hazelnut-Chocolate Spread). 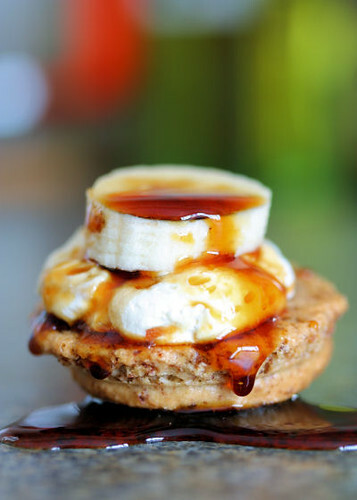 The recipe comes with a statutory warning, which should be carefully heeded, but make it and you will be blissfully rewarded - especially if you spread it on toast with grilled bananas! Bong Mom from Bong Mom's Cookbook brings us the warm fuzzy feeling of the holidays with her Nutella Chocolate Truffles. These truffles will light up your cold days, and make great holiday gifts, but best of all, they are so easy an 8 year old could make them! Judith from Foodie Loves Baking has indulged us with some fabulous Gingerbread Cupcakes. Not only are they spicy, dense and laced with drunken rum soaked raisins, the cream cheese frosting has been infused with orange zest! Anne from Anne's Kitchen gets all nostalgic with her festive Sweet Christmas Cracker. Using all butter puff pastry, boozy mincemeat and an extra scattering of Barbados rum soaked sultanas, Anne then decorates her cracker with colourful glace cherries, slices of orange, silver balls and finally a sprinkle of hazelnut crackle - wow! 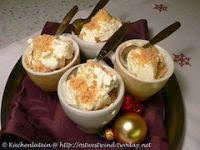 Ulrike from Kuechenlatein has made this special dessert called Spekutlatius-Tiramisu. 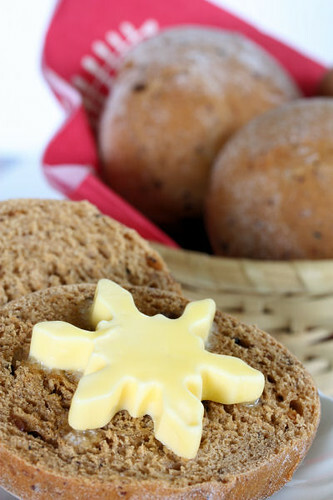 It's a simple, but light and delicious dessert, made from Spekutlatius, which are spiced biscuits in the shape of a human or other figure, and is eaten at Christmas in Germany. Cathy x from aficionado can no longer consider herself a pie making virgin, as she adds this Cherry Pie with Almond Pastry Cream to her baking repertoire! 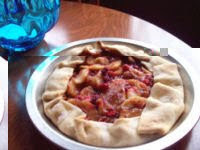 The pie is stunning, made with weaved-lattice crust and tender, flaky, buttery pastry; filled to the brim with sweet, black and bubbling cherries; smothered with velvet-smooth pastry cream, infused with the nutty, earthy taste of almonds. 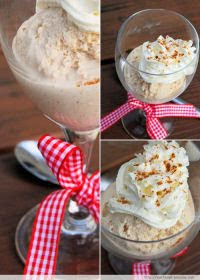 Zorra from 1x umruehren bitte aka kochtopf had the idea of turning some traditional Puerto Rican Christmas Punch into some festive Coquito Ice Cream. 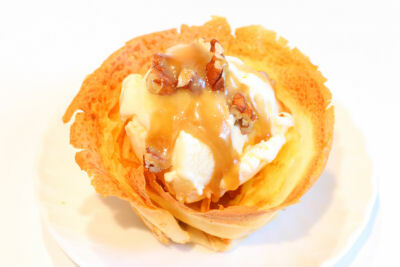 In doing so, she created a unique Christmas dessert that is very addictive! 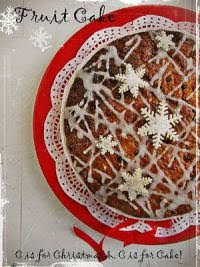 Deeba from Passionate About Baking carries on an annual tradition when she makes her Mom's Christmas Fruit Cake. It's got a special secret ingredient - garam masala, which just enhances the flavour throughout the cake once mixed with cinnamon & brandy etc. Some of the best recipes are those which have been handed down and if you make this a few of weeks in advance, you will be rewarded with a luxurious mature cake! 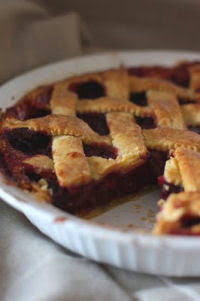 Kristen from Something Sweet has thrilled me with this easy-to-put-together Rustic Apple-Cranberry Tart. You can use any fruit combination you like, but sweet apples and tart cranberries are particularly welcome for the festive season. 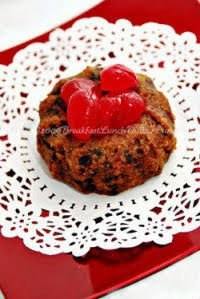 Wizzythestick from Breakfast Lunch Dinner and Punch says it just wouldn't be Christmas without her Black Cake. She actually has to mail tins of this wonderful Caribbean cake to her friends and family abroad who crave a taste of home. And if you make it, don't forget to drench it in a whole bottle of rum! Johanna from Green Gourmet Giraffe had to exercise great self-control to stop nibbling her warm Chocolate Panforte, and who can blame her when she used home-made fruit mince! 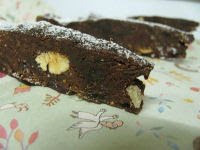 Her mother loved the Panforte so much that she encouraged Johanna to make one to take to her grandmother for Christmas! 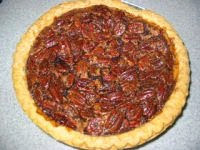 NerdMom from NerdFamily Food has used chocolate to give her Super Easy Chocolate Pecan Pie a twist. This fabulous pie has become their family tradition, for both Thanksgiving and Christmas, and no-one will ever know if you cheat and use a deep dish frozen pie crust! Jennifer Hamilton from Domestic Goddess and creator of SHF comes armed with Cranberry Bliss Bars, a copy-cat recipe of the delicious treats you can only get from Starbucks...until now! 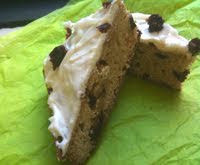 The bars are sweet, tart, delicious; a hybrid of a cookie and a cake and topped with scrumptious cream cheese frosting. The perfect treat to put you in the holiday mood! 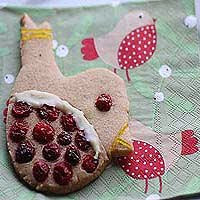 Mangocheeks from allotment2kitchen admits to never having made Christmas biscuits before, but you would never know that after seeing these amazing Cranberry 'Belly' Robin Biscuits! The biscuits were made using a template cut from an old Christmas card, and they are beautifully decorated with fresh cranberries - an ingredient that has gained worldwide popularity lately. 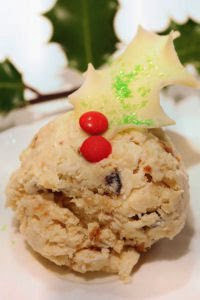 And finally my own SHF entry, Mince Pie Ice Cream! If you sent me an entry and it's not here, it's possible it got lost on the way or eaten by the spam box. Please email me again and I'll include it - thanks! Thank you once again for all your wondefully festive entries, the holiday season may be coming to an end, but these recipes can be enjoyed throughout the year, or put on your list for the next time we are celebrating something special! And many thanks to Jennifer of The Domestic Goddess, for letting me host this month. Jennifer is looking for a host for January's SHF, just go to her page and email her for the details! Hope you all had a wonderful festive holiday!